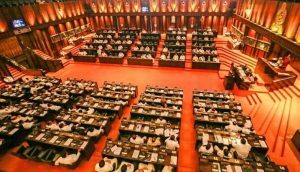 The attention of the Constitutional Council is drawn to filling the posts that would be vacant when the Auditor General H.M. Gamini Wijesinghe and the Chief Justice Nalin Perera retire from their posts say reports. The matter has been discussed when the Constitutional Council met on the 5th. As such, the Constitutional Council will meet again before the end of this month to recommend the names for the two important posts of Auditor General and the Chief Justice. The Constitutional Council will make its recommendations once the names for the two posts are sent by the President. Chief Justice Nalin Perera is scheduled to retire from his post on the 28th while Auditor General H.M. Gamini Wijesinghe has already handed over his letter of resignation say reports.